When Are You Going To Be Able To Get Wi-Fi On Your Next Flight? Take that non-interactive books, wi-fi should be up and running on many flights soon. In a related development, the romantic-comedy genre is expected to experience a steep drop in viewers due to its heavy reliance on bored, captive plane passengers for most of its business. This article runs down who’s getting it and when. Virgin seems to be at the forefront, with service expected in its entire fleet by early-2009. American has been testing its system and is in the process of evaluating how soon to roll it out. Southwest, Alaska, and JetBlue all have committed to seriously thinking about it, and will quickly work on contemplating whether to further continue deliberating. I wouldn’t hold my breath. Oh and if you’re wondering, that is in fact me in the above picture. 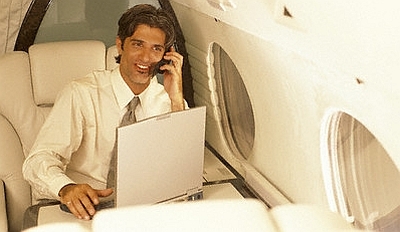 Sometimes I like to take our TheExpeditioner.com private jet out for a spin and just gab on the phone with my friends the entire time while watching funny YouTube clips on my computer. It’s a guilty pleasure.